Following in the footsteps of several other universities, University of Nebraska President Hank Bounds sent out a university-wide letter in response to President Trump’s executive order, which temporarily bans refugees from seven Muslim-majority countries. The University of Nebraska system has around 150 students, faculty and staff members from the seven countries listed in the immigration ban, according to Bounds’ letter. UNO graduates, including Ebrahim Abdulsattar, are also affected by the immigration bad. 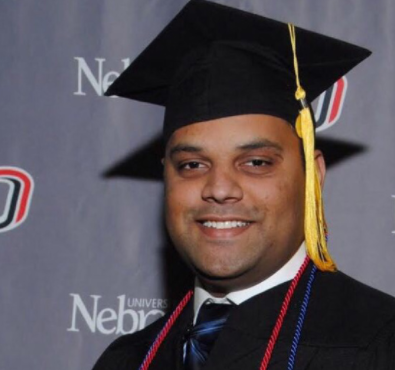 Abdulsattar graduated from UNO in 2015. He was born in Yemen and said he felt encouraged by the support offered in Bounds’ letter. Abdulsattar first came to the U.S. for a student exchange program at age 15. Once he completed the program, he returned to Yemen until he came to UNO when he was 20 years old. Now, he works at First Data and hosts Syrian refugees. All his family lives in Yemen, and he can’t visit them because he wouldn’t be allowed back in the country. “With this executive order, you either have to sacrifice your future that you worked for or sacrifice the family you haven’t seen for five years,” Abdulsattar said. His siblings have grown up without him. One of his brothers is seven years younger than he is. The last time Abdulsattar saw him, his brother was a little boy. Abdulsattar said the international presence at UNO helps expand people’s awareness of other cultures and allows students to develop relationships with people from different cultures. Parwin Ibrahimi, who is a staff assistant for UNO’s School of Communication and a refugee, has also felt the affects of the immigration ban. Ibrahimi, who was born in Afghanistan, was admitted to the United States as a refugee in September of 1980. Ibrahimi’s family decided to leave Afghanistan after the Soviet invasion. Her sister was a well-known doctor in the area, and one of her patients lived on the border between Pakistan and Afghanistan. Ibrahimi and her family crossed the border into Pakistan overnight and stayed with her sister’s patient. Ibrahimi was nine months pregnant at the time. They had to cross the border with only the clothes they were wearing. Any bags would’ve drawn suspicion. Ibrahimi’s sister made her family wear her gold jewelry so she wouldn’t have to leave it behind. After Ibrahimi’s son was born in Pakistan, the family moved to India for 11 months. A year after fleeing Afghanistan, their paperwork to come to the United States was processed. Now, Ibrahimi and her family have been here for over 35 years. Recently, someone asked Ibrahimi where she was from.